in the spring of 1978. "The Abbot expressed pleasure that I had come with what he said looked to be 'wonderful artist's materials.' Offering to help with our luggage, Abbot Gilbert did not wait for an answer, and picking up a suitcase, he led us into the cloister. "Ronald and I followed the Abbot down a long vaulted hallway with white walls above mint-green wainscoting and a black and yellow-ochre, checkered, tile floor. Pointed arches gave the cloister a Gothic grandeur. "The Abbot escorted me into my room with my luggage and art materials. The clean, small room was simply furnished with a chair, desk, and reading lamp by a window, and a bed, night table, and wardrobe cupboard. Near one corner of the room was a sink on which had been placed a clean drinking glass and a new bar of soap. A towel rack held fresh, white towels. "Abbot Gilbert invited Ronald and me to join the monks for the Divine Office, the communal worship in choir, and he mentioned that on the desk a card listed the times for the daily round of prayers. He said that the card also indicated the times for meals, which we would take with the monks in the refectory. "The Abbot explained that mealtimes were announced by the ringing of a bell in the cloister. Ronald and I should assemble with the monks by the refectory double doors and at the appointed time, signaled by a second bell, file into the refectory and take our assigned places at one of the refectory tables. "Abbot Gilbert thoughtfully asked me if there was any food I could not eat. I thanked him for asking and said that although both my maternal and paternal grandmothers kept kosher, my mother and father followed the principles of Reform Judaism, which did not require dietary restrictions. I was deeply touched by Abbot Gilbert's kind consideration, which exemplified for me the ecumenical spirit of Vatican II." At the front door of St. Augustine's Abbey, on that Friday afternoon in late April when Roseman and Davis were expected at the monastery, an elderly Benedictine monk who answered the door cordially invited them in, asked them to take a seat in the entryway, and went to announce their arrival to the Abbot. "The eastbound express train from Victoria Station in the center of London took about an hour and a half to reach the town of Ramsgate on the coast of Kent. Getting off the train, Ronald and I each carried a suitcase and shared additional luggage that included a shoulder bag, a six-foot roll of canvas, my paint box, portable easel, and travel bag of painting and drawing materials. "Opposite the train station, we boarded a local bus that followed a route through a residential neighborhood and onto a road along the Thanet Cliffs. The driver kindly alerted us as we approached a bus stop along a high, gray wall and told us we had arrived at St. Augustine's Abbey. "In a few minutes the elderly monk returned. Ronald and I stood, and through the opened door to the cloister we saw walking quickly towards us a figure clothed in a black habit and wearing a wooden pectoral cross. He was in his early fifties, of medium height with a fair complexion and friendly eyes behind tortoise-shell rimmed glasses. Abbot Gilbert was as gracious as his letter and warmly welcomed Ronald and me to his monastery. "Abbot Gilbert said he would first take us up to our rooms and see us settled in, then bring us back downstairs for tea in the common room and to meet members of the community. He said that after tea he would take us on a tour of the monastery. Father Paulinus, a bald-headed, bespectacled monk puffs away on his pipe in an excellent drawing in a private collection, Michigan; and Father Cuthbert, the tall Subprior, with wisps of white hair that fringed his longish, aging face, holds a tea cup in his hand in a fine drawing (Private collection, London). Dom Damian, the young, pleasant sacristan and assistant librarian with dark hair closely cropped in the Benedictine tradition, kindly made the library available to his new friends and loaned them books for their research and study on the monastic life. He was also to be a subject for Roseman's artwork, as exemplified by the fine drawing below, (fig. 6). "I am writing to thank you for your gift of the drawing of Dom Bede by Stanley Roseman. We are very pleased to be able to represent his work in this Collection. The identity of the sitter, Dom Bede, gives the drawing a particular significance since Dom Bede collaborated in the recent Pugin exhibition. The drawing is also an excellent example of modern portraiture. In terms of its subject, medium, and intrinsic quality the drawing fits extremely well into the V&A's collecting policy and is a notable acquisition." "Returning from the library, the Abbot escorted us back to the main monastery building and through the cloister where we stopped by a green, wooden gate that projected into the corridor. The Abbot opened the gate and led us down a flight of steps and into a dimly lit, narrow, underground passageway, which increased the sense of adventure on Ronald's and my first day in a monastery. "We emerged into a neo-Gothic church, the interior of which flickered with colored light from stained glass windows. Abbot Gilbert told us that the church was designed by the renowned English architect Augustus Welby Pugin, noted for the Houses of Parliament and for promoting Gothic revival architecture in the British Isles during the nineteenth century. The interior walls of Pugin's church were of ashlar and the monks' choir stalls, dark polished oak. "Ronald and I accompanied Abbot Gilbert back through the underground passageway, up the steps, and into the cloister. We proceeded to the refectory, a white hall with dark wainscoting and two long parallel rows of dark wooden tables. The ceiling was traversed with dark wooden beams and the floor was patterned with black and ochre, checkered tiles, the same as in the cloister. At the head of the rows of tables was a separate table reserved for the Abbot and the Abbot Emeritus. To one side of the abbots' table stood a lectern, where, as Abbot Gilbert explained, a monk taking his turn for the week read aloud during the meals while those at table ate in silence. 5. The Church of St. Augustine's Abbey,1978. 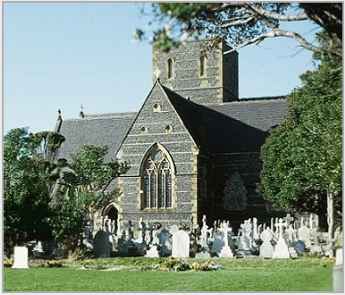 The church was designed and built in the mid-nineteenth century by the renowned English architect Augustus Welby Pugin. "The Abbot said as it was Friday, a day of fasting for the community, there would be a sparse supper of bread and cheese. He further explained that the reading was suspended for Friday evening meals, although the monks took their meals in silence as was customary. One was free to leave the refectory when one finished his supper, without having to wait for the entire community. Abbot Gilbert thoughtfully insisted Ronald and I were hungry after our journey from London. He asked a monk to prepare omelets and vegetables, with servings of bread and butter, for Ronald and me. After seeing that we were well taken care of, the Abbot excused himself saying that he would return later and closed the refectory doors behind him. "Ronald and I sat at the places that were set for us at one of the refectory tables. We began to adapt to life in a monastery by taking our meal in silence, save for the ticktock of a grandfather clock that stood at the far end of the refectory." "After tea," the artist recalls, "Abbot Gilbert invited Ronald and me on a tour of the monastery. We began with the chapter room, where by tradition regular meetings of the chapter, or assembly of solemnly professed monks, are held to discuss matters concerning the community and the administration of the monastery." "That weekend at St. Augustine's Abbey passed quickly. Ronald and I had planned to depart on Monday as we had not presumed upon our invitation and had asked to stay for only the weekend. I could not help feeling sad in preparing to leave. I was just beginning my work, and Ronald and I had become comfortably acquainted with the abbey and a daily routine that only a few days before was completely new to us. "Monday morning was overcast when Ronald and I departed St. Augustine's Abbey, and the weather was appropriate to our mood. But the expression of friendship and encouragement from the Abbot and the community and their assurances that they were looking forward to our return brightened our leave-taking as we set off in continuation of our monastic journey." Moreover, St. Augustine's Abbey has a direct tie to St. Benedict's monastery of Subiaco, in Italy. The Abbey of Subiaco, founded in the sixth century, is the birthplace of Benedictine monasticism. The founding members of St. Augustine's Abbey in the nineteenth century were English monks sent from Subiaco. 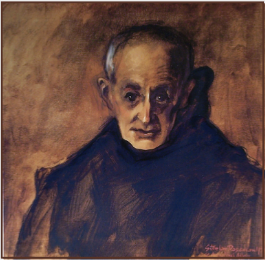 Roseman and Davis returned to St. Augustine's Abbey in June 1978, and following their sojourns at Mount St. Bernard Abbey and their travels to Trappist monasteries in Ireland, they returned again to Ramsgate for the month of September, when the artist created impressive paintings of the monks. Roseman painted portraits of Abbot Gilbert and the retired Abbot David Parry for the abbey's chapter room. At the time the artist painted Abbot David's portrait, the Abbot Emeritus was working on a new English translation from the Latin of the Rule of St. Benedict for the upcoming fifteenth centenary of the Saint's birth. St. Augustine's Abbey, Kent, England, 1979. "an excellent example of modern portraiture"
"this work of art of profound insight and spirituality"
Roseman relates: "Ronald and I corresponded with Abbot Gilbert during our travels, and in a letter of encouragement the Abbot writes, 'I am full of admiration for your achievements and look forward so much to welcoming you back to Ramsgate.' Ronald and I too looked forward very much to our return in December 1979 and were appreciative of the invitation to spend Christmas at St. Augustine's Abbey. We were given our former rooms and included again in the life of the community. "At St. Augustine's Abbey, we attended Midnight Mass with the Community in the church, which was aglow with candles and festively decorated with beautiful floral arrangements. On Christmas day, Ronald and I were honored to sit at the abbots' table, and we all enjoyed a marvelous Christmas dinner, complete with traditional mince pies and plum pudding with hot melted Brandy butter on top." 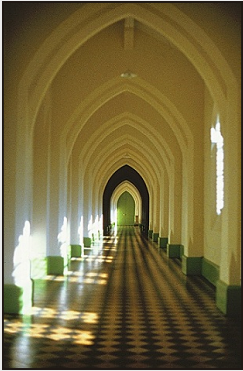 "I resumed drawing the monks in choir, the library, the refectory, and at tea in the common room, where the monks engaged Ronald and me in lively conversation about our travels to monasteries across the Continent, behind the Iron Curtain to Hungary and Poland, to the Abbey of Subiaco, and the following year, to monasteries in France and Spain. 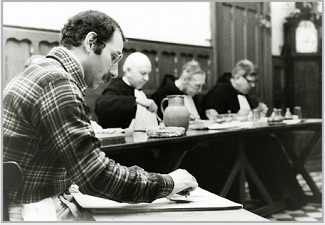 That April weekend 1978 at St. Augustine's Abbey was an auspicious beginning to Roseman's work on the monastic life. Abbot Gilbert told Roseman and Davis that their work was providential as the monastic world was preparing to celebrate in 1980 the 1,500th anniversary of the birth of St. Benedict of Nursia (c.480-c.547), revered as the Father of Western monasticism. The Rule of St. Benedict, which gives spiritual guidance and regulations for communal living in a monastery, is the basis of monastic observance in the Western Church. Roseman and Davis had received a warm letter of invitation from Abbot Gilbert Jones of St. Augustine's Abbey. Davis wrote from New York to monasteries in England and Ireland to introduce his colleague, relate his interest in monastic life as a prospective subject for his paintings and drawings, and make a request for a sojourn. "Dom Damian kindly offered to loan Ronald and me any books from the library we would like to take with us. We were very appreciative to our new friend to be able to borrow the two books on monastic history that we were each in the midst of reading. 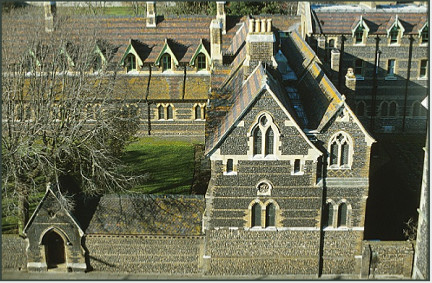 The Abbot next brought his two guests to the library, a neo-Gothic building accessible by a footpath across a lawn. Roseman recounts: "I was impressed by my first monastery library, which was soon to be a place for research and study for Ronald and me. The large, vaulted single room rose two stories with three tiers of bookshelves divided into sections marked 'Theology,' 'Liturgy,' 'Monastic History,' 'Church History,' 'History,' 'Philosophy,' 'Science,' 'Literature,' 'Music,' and 'Art.' 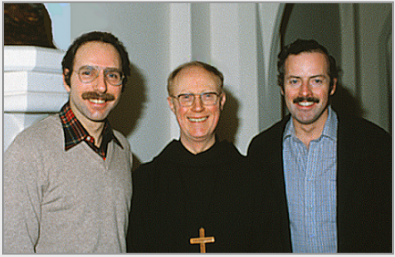 "
In his remembrances of his first days in a monastery, Roseman writes: "With Abbot Gilbert's warm welcome and the community's hospitality, Ronald and I easily fell in with the regimented, daily routine at St. Augustine's Abbey.'' The artist speaks of beginning his work drawing the monks in choir at Vespers and Compline. He relates attending the midday office in the monks' private chapel, partaking in the ritual of the common meal in the refectory, and being included in the life of the community in a familial way, such as by assisting with washing up and putting away the dishes in the pantry. The artist writes that he and Davis researched and studied in the library and enjoyed convivial afternoon tea in the common room. 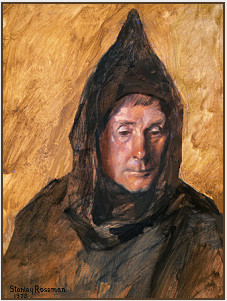 In Roseman's oil on canvas Dom Francis, Portrait of a Benedictine Monk, warm earth tones in the summary background complement the monk's black habit and raised hood that frames the sensitive face rendered with cool highlights and warm shadows. Roseman has beautifully expressed in the portrait of Dom Francis a deep feeling of the interior life of the monk. "Like his saintly namesake, Dom Francis was very caring of animals and provided meals for the cats that came around to the kitchen door of the monastery. I mentioned to Dom Francis that in my youth I had a dear feline friend, an Abyssinian cat named Aby. The fondness for cats that Dom Francis and I shared established an immediate rapport between us." for this work of art of profound insight and spirituality." And indeed they were memorable subjects for the artist's work. Seen below, (fig. 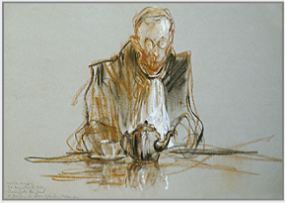 4), is Father Gregory, a middle-aged monk with a rosy complexion, round-rimmed glasses, and a white table-napkin tucked into the collar of his black Benedictine habit as he waits at table for his tea to steep. Roseman's portrait of Dom Bede was a gift to the Victoria and Albert Museum from the artist and his colleague in memory of their friend who passed away in 1993. Dom Bede Millard was a skilled craftsman in church vestments, extremely knowledgeable on Pugin, and contributed the chapter on 'Ecclesiastical Textiles' for the Museum's Pugin exhibition catalogue, 1994, posthumously dedicated to the Benedictine monk. In the present work a luminous pictorial space envelopes the figure of the monk clothed in his black, Benedictine habit. The rapport between the artist and the monk is evident in the masterly rendered painting of Dom Henry, who looks directly out from the canvas. Here Roseman has created a deeply-felt portrait with a powerful presence of a man who has dedicated his life to meditation and prayer in devotion to God. 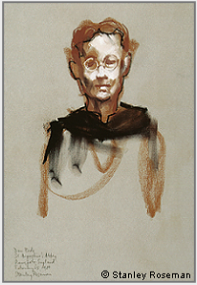 The impressive drawing Dom Bede, Portrait of a Benedictine Monk, 1980, (fig. 9, below), was acquired by the Victoria and Albert Museum, London. "Dom Bede, four years younger than Ronald and myself,'' writes Roseman, "was a friend from our first year at Ramsgate. Born in Wales, Bede shared a common heritage with Ronald, whose paternal ancestry is Welsh. We shared interests in art, architecture, music, and history and kept ongoing correspondence as Ronald and I continued our travels to the monasteries. . . ."
''When I began researching and planning my work on the monastic life," Roseman recounts, "my thoughts were towards Europe for monastic life is interwoven with the history and culture of Europe." Davis, who was raised in the Roman Catholic faith, participated in the research and the planning of an itinerary to the monasteries and took on the responsibilities for organizing the journey. Monastic life at that time in the 1970's was little known to the general public and an unfamiliar subject for a modern artist's work. Writing about the contribution of the monastic orders through the centuries of European history, Roseman observes, ". . . Nevertheless, in Western Art monastic life accounts for a small percentage of the extensive imagery on religious subject matter." Exemplary of the artist's drawings of a monk in choir is the beautiful work entitled Dom Damian, A Benedictine Monk kneeling in Prayer, 1980, (fig. 6). The figure of the kneeling monk is turned towards the high altar and seems enveloped in a cool light suggested by the gray paper. Roseman renders Dom Damian's voluminous black cowl with strong, fluent strokes of black chalk. In the pyramidal composition shaded passages accentuate the triangular shape of the hood and give rounded form to the monk's inclined head. 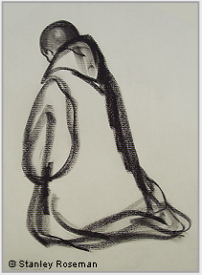 Roseman has created a compelling image of a Benedictine monk kneeling in prayer. Davis' photographs provide a visual record of the artist at work behind the monastery walls. In 1980, the year the monastic world was celebrating the 1,500th anniversary of the birth of St. Benedict, Roseman and Davis returned to St. Augustine's Abbey, where the artist resumed his work.